Product prices and availability are accurate as of 2019-03-31 01:37:03 EDT and are subject to change. Any price and availability information displayed on http://www.amazon.com/ at the time of purchase will apply to the purchase of this product. Drink Local! Pick up this "Drink Beer From Here" Kentucky wooden drink coaster and show your support of Kentucky brews. These coasters will make the perfect addition to your kitchen, bar, man cave, or just about anywhere. 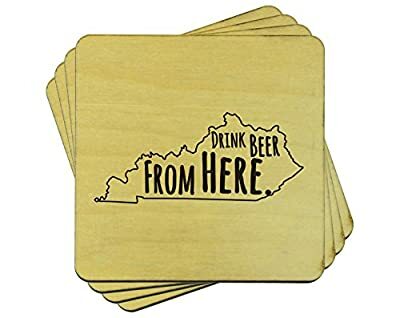 We professionally laser engrave the award winning drink beer from here design used with permission from HopCloth right onto our wooden coasters.